As Fort McMurray prepares for their launch of Dolly Parton's Imagination Library in Canada, Dolly takes a few minutes to talk with Edmonton AM. For more information about Dolly Parton's Imagination Library of Fort McMurray, Canada visit their Champion Information page. Good Monday morning & afternoon everyone! Here are a few articles that made their way around the internet this past weekend. Do you have a story to share? Let us know by sending an email to support @ imaginationlibrary.com. 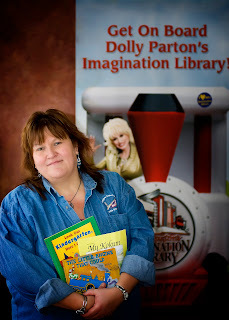 Dolly Parton's Imagination Library is letting you earn FREE SWAG now through March 31, 2012! Do you Facebook? Are you on Twitter? Do you surf the internet? If you answered yes to any of those, then you can win FREE SWAG just by telling your friends & family about our program. Update 3/26/2012 - Congratulations Karen! Karen just received word that thanks to your votes, her cause won $5,000.00! Karen Davis from Dauphin, Manitoba Canada has been a volunteer for Dolly Parton's Imagination Library in Canada for more than 3 years. From the beginning, Karen has really made things happen for the children in her country by helping expand Dolly's Early Childhood Literacy program. Recently nominated to be part of the "Innovative Approaches To First Nation, Metis & Inuit Learning in Canada", Karen needs our help to win! With just about 4 days left (from the time of this blog) we ask that you consider casting your vote for this fine, fine lady! I, your blogger, have had the privilege of meeting and talking with Karen and I can personally tell you that she lights up the room when she enters and her positive attitude and productivity are simply infectious. If we can pull out a win for Karen, this could mean $5,000.00 for the children of Canada and that's a lot of books. 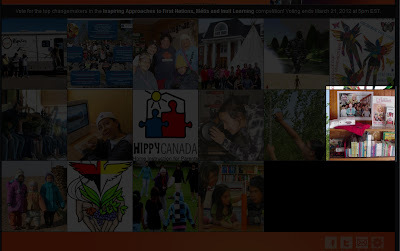 To vote for Karen please visit: http://www.changemakers.com/fnmi-learning/test.